Since 1977, Hotwork has provided a service to safely and efficiently drain the molten glass from furnaces of all types and sizes. 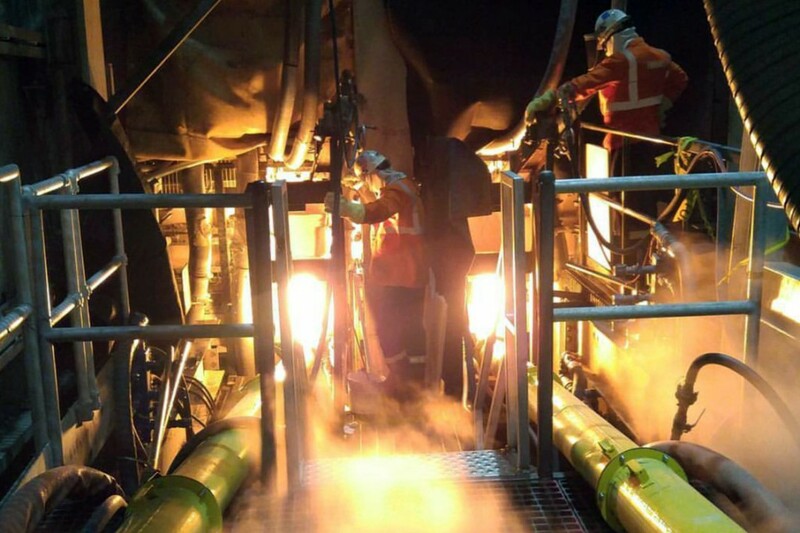 Hotwork has developed proprietary practices to tap into a furnace sidewall, control the flow of molten glass to a trough, and catch the molten glass in a receiver with a high pressure jet of water. The water jet simultaneously quenches the glass and transports it through a pipe to a cullet collection area. The water and cullet are separated and the cullet is collected for later re-use by the glass manufacturer. Hotwork engineers the drain service to conform to various constraints and objectives specific to each client. Hotwork has the ability to carry the glass and water around bends and even on an uphill slope. Drains can be conducted using a plentiful supply of cold water or the water can be recycled to minimized makeup water consumption and the release of contact water. Depending on the specific conditions of the drain and the size of the furnace, glass drain rates in excess of 20 tons per hour have been achieved. In some cases, dual furnace taps are utilized which can result in drain rates in excess of 40 tons per hour. Hotwork currently conducts approximately 40 furnace taps per year and is constantly refining and improving the practices utilized.